Yesterday, I saw a flash of yellow on the edge of Yesler Swamp, in a tree covered with last year’s fluffy white seed balls. I’ve been noticing yellow more as the sun has decided to appear again in our cloudy, gray skies. But this was no glint of sunlight. 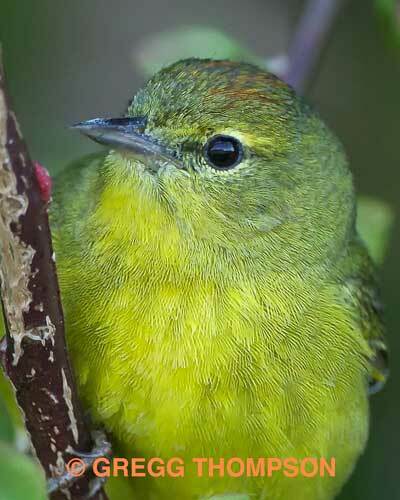 It was an Orange-crowned Warbler, looking bright and newly fledged in breeding plumage. It was weeks too early for such a warbler to be here, however. In fact, it was weeks too early for me to be out birding in just two layers of thermal clothes. I needed three or four, at least. The wind was howling, the trees were thrashing, and ice had only recently retreated from my windshield. Spring is definitely on the way, but winter is still putting up a fight. It was bitterly cold, and I was huddled in my car with the heater going full blast. “Ah, that’s our overwintering guy,” I said to Alex MacKenzie, my birder friend who was spreading her hands in front of the car’s heat vent, trying to restore circulation. She had tried to walk the Loop Trail in this winter storm and had made it as far as the Dime Lot, when she saw my car and hustled over to get rescued. Every now and then, a summer warbler elects to stay in Seattle all winter, instead of migrating south with everyone else. It’s a hard life for an insect-eating bird, especially when relentless rain and snow kill all the insects. I had first seen this little Orange-crowned toughie back in December, foraging for frozen insects along the fence that borders the western edge of the swamp. Birders have reported seeing him near here for weeks now, but I had not been able to find him again. Now here he was, feisty as ever, the Ernest Shackleton of avians. A survivor. This entry was posted in Uncategorized on April 2, 2012 by constancesidles.